(This version is an attempt to update the applet I developed some 10 years ago. I don't know why the zoom tools aren't here, but I'll figure it out eventually...) This applet shows projectile motion for both the first-order air resistance ("drag") and for the usually-assumed vacuum cases. The drag coefficient is k; when this is zero the drag trajectory is not shown. The Galileo complementary trajectory is shown only when the initial height y0 is zero. The units are SI. The velocity vectors are shown, and can be scaled by the vscale parameter (this changes the vector lengths to a convenient size). The tscale parameter sweeps the time through a range of 0 to the current vacuum time of flight (TOF). The angle slider would not accept a negative value if the angles were in degrees so the slider reads out in radians. Use some common sense in interpreting the graphs, since it was not clear how, or was more trouble than it was worth, to limit things like using a negative angle if the initial height is zero. The button at the lower left will sweep the time parameter so that the particle's motion and the velocity vector changes can be seen. 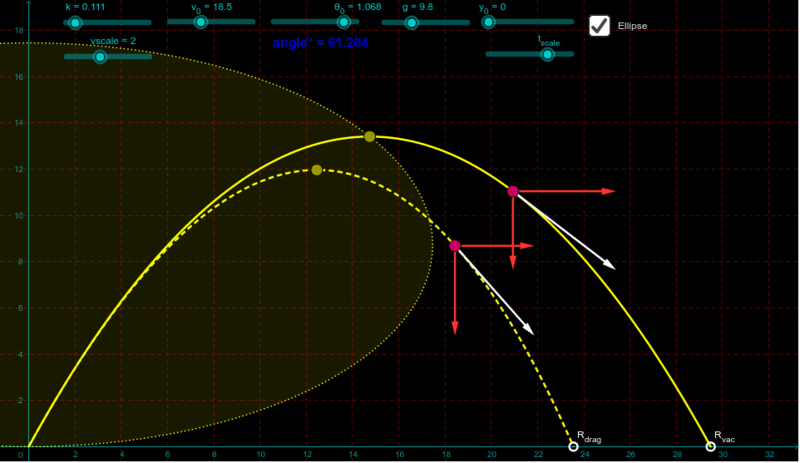 The ellipse option shows the positions of the trajectory maximum heights for a zero initial height and constant initial velocity. When this is enabled the Galileo trajectory is turned off, to reduce clutter. See the "Projectile Motion Math" activity for PDFs with analysis of selected projectile motion topics.